Tech’s best kept secret plays on a weekly basis in McCamish Pavilion. The Jackets squad that has dominated the competition thus far, including a signature win over a tough Syracuse team this month, has done so thanks to a top-tier recruiting program, passionate and involved coaching and a hefty dose of fan enthusiasm. Arguably the most exemplary, standout program on Tech’s campus is the women’s basketball team — and though their attendance numbers do not suggest it, they are wholly deserving of your attention. We cannot deny that women’s basketball programs are less popular among sports fans than their male counterparts. In 2013, the WNBA averaged about 400,000 viewers compared to about 1.5 million viewers for NBA games. The difference is even more pronounced at the collegiate level — the NCAA Women’s Basketball National Championship registered just 3.5 million viewers, but the finale of the men’s version of March Madness picked up 16.5 million viewers. The lack of popularity is doubly damning: it is far easier to get involved in a sport when your friends follow it as well, disincentivizing fans from joining. But truly, all it takes to become a fan of women’s sports is a simple first step. And indeed, Tech’s women’s team knows how to execute. That much was on full display Sunday, when Tech upset No. 12 Syracuse 65-55 behind strong showings by Liz Balogun and Kierra Fletcher. Head coach MaChelle Joseph has put together a strong program on the back of aggressive recruiting, especially internationally and this team can hang in with almost any program in the country. Tech has a talented team, with Fletcher, Balogun and former ACC Freshman of the Year Francesca Pan anchoring the roster with more talent on the way. So why are Tech women’s basketball games so sparsely attended? The women’s team has a pretty good shot to make the NCAA Tournament while the men’s team is a long shot for even the NIT, universally viewed as a consolation tournament. Why are we so unwilling to give a team with two McDonald’s High School All-Americans — and another five-star prospect, to boot — more attention? It’s because we’ve failed to give women’s basketball a chance. And each of us can correct that. 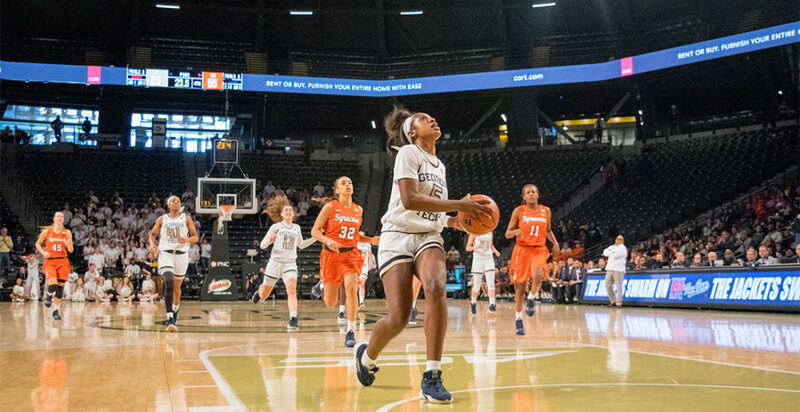 This spring, show up to a game at McCamish Pavilion and watch MaChelle Joseph’s team in addition to Josh Pastner’s. Find yourself a nice seat — almost all of them are available. Sit down and witness some of the best women’s basketball players in the country do what they do best. There isn’t any dunking and the players are smaller, but the product that Tech puts on the court deserves not just respect but attention.